Mid 1800s, New York City. 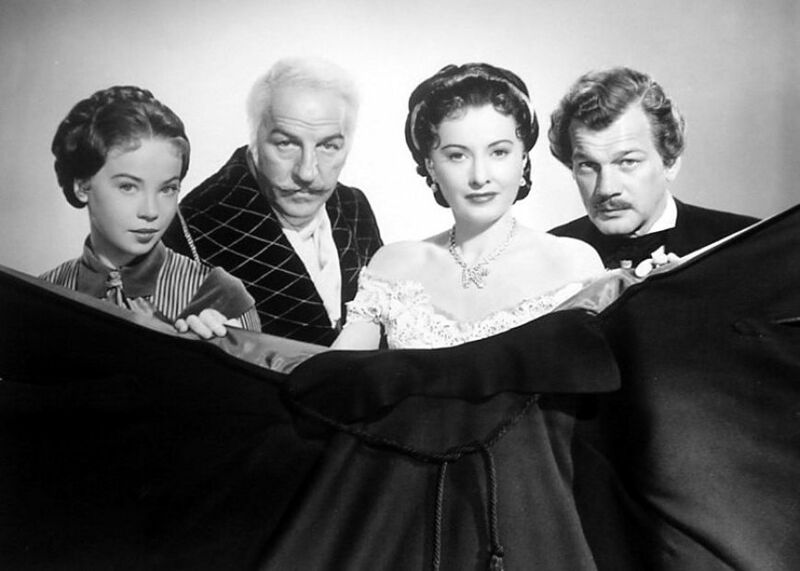 The young, French Madeline Minot (Leslie Caron) has come to NYC to track down her fiance’s estranged grandfather, Thevenet (Louis Calhern), with the ultimate goal of getting money out of him to support her fiance’s political cause. When she finds the man, he is old and grumpy. He lives in a very large house with a butler named Martin (Joe De Santis), a housekeeper named Mrs. Flynn (Margaret Wycherly), ex-stage star Lorna Bounty (Barbara Stanwyck) and a pet raven named after French poet Francois Villon. Madeline theorizes that these housemates are just waiting for Thevenet to die so they can get their hands on his bountiful stores of money, and she even suspects that they may be trying to kill him so they can inherit the fortune sooner. But her arrival has thrown a hitch in their plans, as Thevenet decides to change his will. Madeline finds an unsuspecting ally in Dupin (the film’s title character, portrayed by Joseph Cotten), a local unemployed, alcoholic poet. 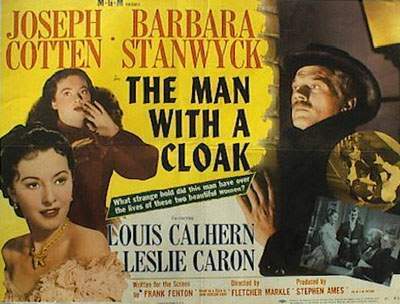 The Man with a Cloak was directed by Fletcher Markle (Jigsaw, Night Into Morning). It is based on a story called “The Gentleman from Paris” by John Dickson Carr and was adapted for the screen by Frank Fenton (River of No Return, Garden of Evil). This film is a shadowy Victorian mystery/thriller, very much based in greed and suspicion. It’s quite moody, but at the same time very entertaining due to the oddities that appear. The odd ducks save the film, which is otherwise all mood with very little real suspense or surprise. The eeriness of the characters, who are a bit eccentric and unusual, keeps the film moving at a slow but steady pace. Thevenet himself is certainly a strange man, with his pet raven and constantly shifting moods. He’s a bit Vincent Price-ish in some of his mannerisms. Cotten’s boozy, dreary character proves a surprisingly substantial opponent to Stanwyck and her gang of merry, potential murderous house staff. He also brings in a slew of Poe references that the viewer can catch. In an obvious moment of reference, Cotten leaves his “IOU” to the town bartender under Poe’s exact name. A sneakier example comes from the name “Dupin,” which readers of Poe’s ‘The Murders in the Rue Morgue’ would be familiar with. Even Leslie Caron gives off an air off suspicion as outsider Madeline, though her delivery is always very sweet and proper. The best character in the film is probably the under-utilized Martin, who comes off as a complete and total creep but is a fantastic addition to heighten the curiosity and speculation of the viewer. Along with the few great characters who work to elevate the film, some noir elements are also infused in order to bolster the viewer’s interest. Visually, dramatic contrast is used pretty consistently in the film – an obvious trademark of the noir genre. Stanwyck serves as that ever-present femme fatale, whose motives and plans are never quite clear. The greed-based murder plot is also a nod to the conventions of the noir genre. I definitely wouldn’t consider this film a true noir, but these elements do work to improve the film’s appeal. I finally gotten around to watching this and I probably need to watch it again. It’s only 80mins and it kind of shows. The girl played an integral part of the plot but kind of disappears for the last act until the very end. That said I agree the film picks up and becomes more engaging towards the end. I guess I wish the director took some liberties in the source material in fleshing out the characters more. The movie felt like it was prime for an orson welles touch whether that’s directing or replacing cotton or someone else. Would have been interesting to see Welles’ take on this, if he had directed. Thanks for reading! Next Next post: Happy birthday, Joots!